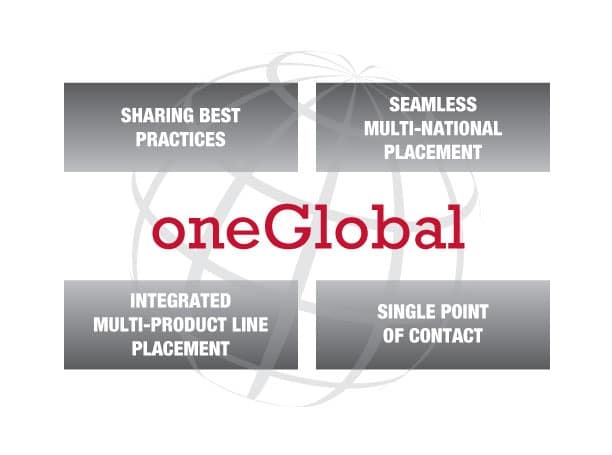 oneGlobal is a core operating principle at Global Aerospace aviation insurance. Global Aerospace customers, anywhere in the world, can seamlessly access the wide range of aviation insurance resources and expertise we offer and benefit from sharing our best practices across many product lines. While we serve many of the largest aviation companies in the world, that same commitment and expertise extends to smaller companies as well. Sharing Best Practices—Delivering major catastrophe response and family assistance that our airline clients receive to our general aviation customer base. Seamless Multi-National Placement—Simplifies Risk Management with common policy wordings to avoid gaps in coverage. Integrated Multi-Product Line Placement—The ability to address all aviation needs of our customers in one transaction. Single Point of Contact—Client Executives for both claims and underwriting for efficient access to Global and to ensure consistency throughout the organization. Global Aerospace supports aviation insurance product lines from light aircraft to all lines of general aviation, manufacturers and aerospace service providers, airlines and satellites.